Luceplan’s Birzi Table Lamp makes a great gift because it’s as fun to play with as it is to use, as much a toy as a lighting fixture. The funnel-shaped body is made out of pressed silicone (currently in three colors). This soft surface begs to be touched. Which is exactly what it was designed for. 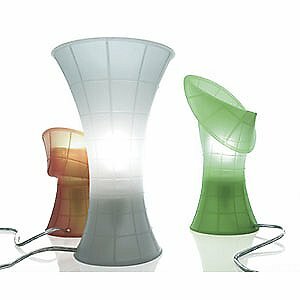 The malleable silicone is able to be–as designers Giancarlo Fassina and Carlo Forcolini put it–“mistreated, deformed and touched.” As such, it can be folded, scrunched and twisted as desired to take on all kinds of different sizes and shapes. So, it’s actually many lamps in one. The Birzi Table Lamp is ideal for people who are just as flexible, folks with a whimsical sense of humor who like to take a literal hands-on approach to their lighting.